There are things that those who live in the North do to make believe that Spring is just a snow drift away. We plant Spring flowers - indoors, of course. We plant paperwhites in January. We marvel at the speed at which their roots appear and their green shoots sprout. We inhale the smell of the damp earth, when we plant them and revel in the perfume of their flowers when they bloom. We plant Amaryllis bulbs too and watch them inch their way up to towering spikes of splendid colour. We discuss over cups of tea, mugs of coffee and glasses of wine, how much further along they are to-day than yesterday. We muse about their colour and how many flowers they will have. We compare them to those we planted in other years and so on, and so on. Wait....did I hear someone say "get a life.." But surely, this is life. 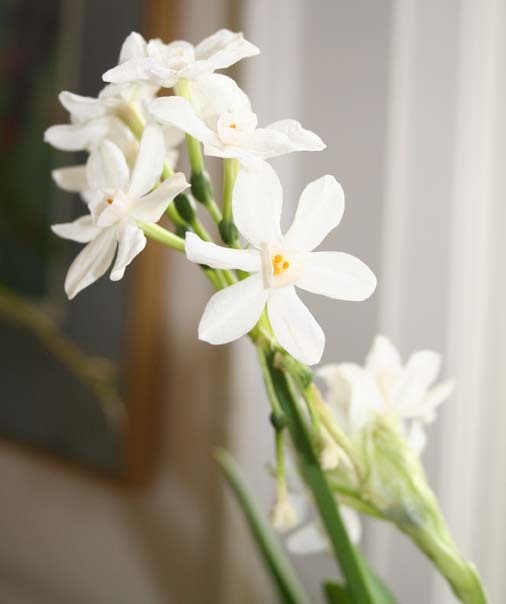 This is time to smell the roses - OK - paperwhites. This is the artists' time to think, to dream, to imagine, to create. Great ideas, great projects need time. They need walks - or as Stephanie Pearl-McPhee says "stomps in the park." They need whole days of nothing...no lists, no pressures, no must haves, must dos. They need just being....!! Sometimes Winter is a great time for just being, because, we spend 4, 5 maybe even 6 months - in a bad year when it could snow in April or even May - imagining or just being. Perhaps this is why knitting became so popular in the North. Yes we needed sweaters for warmth and woolly socks to wear and sheep seemed to take to these frigid climes and yes it gets dark around 4:00pm and stays dark until 8:00am. Lots of time to knit and not feel guilty about making hay...or something...when the sun is shining - that is when it shines, as often it doesn't. And yes it is cold - very cold at times, so knitting keeps the hands moving and warm. We look at the growing garment in our hands and not the blizzard blowing against the icy windows outside. This is our quiet time to be and wait in a suspended state. Think of Yoga and all those who meditate, emptying their minds of the trivia in their lives, to be one with the "force". Waiting, or knitting, for Spring, maybe our way of being one with the "force" - rising to the sublime. I have a copy of Shirley Scott's "Canada Knits - Craft and Comfort in a Northern Land." It is a wonderful history and superb collection of knitting up here. Many of you will know Shirley Scott, as Shirl the Purl, former author and owner of Knitter's News. I have two issues with Shirl. 1. She is not publishing Knitter's News anymore and I remind her everytime I see her how much I enjoyed her newsletter. I miss all the references to knitting that she unearthed in novels and stories and movies. I had forgotten socks being knit in Virginia Woolf's "To the Lighthouse." I don't think there was any mention of knitting when Elizabeth Taylor and that icon of masculine decadence - Richard Burton made "Who's afraid of Virginia Woolf?" Do you think that Elizabeth Taylor knits? It certainly would have changed the movie and perhaps the course of knitting. I also miss Shirley's profiles of knitters and designers. I especially remember Shirl's article on the knitter who had knit all of Lucy Neatby's patterns to date. 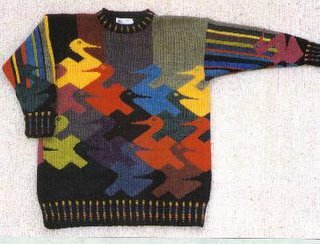 Including The Duck Sweater at left - inspired by the work of M.C. Escher. Now that is something out of this world both the knitter and the knitted. 2. My other issue with Shirley is that she used the word "craft" in the sub-title of her book. Is there a chance of a re-write - Art and Comfort in a Northern Land? Well Shirley needs to do another book, because all this time to knit and dream has spawned some pretty amazing designers, north of the border, since Shirley first published her book with McGraw Hill in 1990. In fact an article in the paper the other day was touting Toronto, as the knitting capital of North America - OK it was a Toronto paper - and it was a slow week for news - there's and election on. What can I say. Anyway the article listed some of the famous names in knitting that live in Toronto. I have started a list below of Canadian knitters that are known widely because of the popularity of the books or the patterns they have published. Anyway here is the beginning of the list. Please add to it any I have missed. 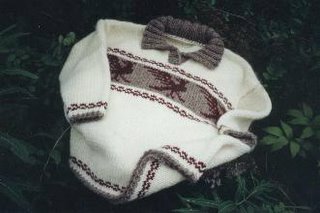 The sweater is Erik by Jennifer Appleby, who is being regularly published in the knitting magazines. It reminds me of the Cowichan sweater patterns. Cowichan knitting is covered extensively in Shirley's book. I know that I have just scratched the surface and I apologize now for any I have missed. Please comment so I can add.